Saturday was a day of melancholy, anger and depression. I left home and walked to the nearest refuge. The refuge was the Oakridge Branch of the Vancouver Public Library. I brought my umbrella. The persistent rain added to my melancholy. It takes just a few days of a Vancouver rain in the fall to make one forget all those days of sunny heat. At my age I am already turning on the heat at home. My first stop at the library is always their reject book bin. It was fairly empty except for one book that stared at me. 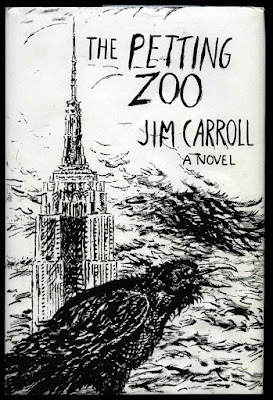 It was Jim Carroll’s posthumously published novel The Petting Zoo. When it came out in 2010 after his death on September 11, 2009 it was panned by most critics. I plan to read it. If you consider that I was charged $0.50 for it and after you read Patti Smith’s Introduction (A Note to the Reader) you will understand that my purchase was a steal. From the library I went to Oakridge Mall and sat in one of their comfortable red single chairs and watched people go by. My melancholy became one of alienation as I found myself feeling I was living in a foreign country. One of my plans in a near future is to stay a few weeks in Patagonia to perhaps relieve this enajenamiento. I walked home protected by my dark blue Vancouver Umbrella Shop umbrella wondering what kind of omen (if any) was finding such an odd book in what really is a mainstream public library going through a demographic change which might explain the massive unloading of such good books. Below is Patti Smith's intro to Carroll's novel. In the monastic seclusion of his room, Jim Carroll, with a prescience of his own mortality, reached out and drew this novel – his last work – from the nucleus of his mysticism and remembered experience. The Petting Zoo unfolds with a series of fated events. The artist Billy Wofram is so profoundly moved by the paintings of Velázquez that he finds himself irrevocably altered. Stumbling from the Metropolitan Museum of Art into an eddy of avalanching absurdity – a defunct Children’s Zoo, the Aztec façade of the Helmsley Building, the bowels of a dysfunctional mental ward – he diagnoses that he is no longer in sync with his former self. His descent and ascent, so candidly observed, are reminiscent of René Daumal’s A Night of Serious Drinking, as our narrator reels from numbing cocktails to the nakedness of his mischievous soul. The poet is the aural lamplighter. He projects himself within the labyrinth of Billy’s burgeoning consciousness as he seemingly adjusts to the most outrageous turns of fortune. Jim’s mythic energy is at once laconic and vibrating; his bouts of meandering humor are punctuated by undeniable common wisdom. Whether the discourse is with a Chinese psychologist, a Hindu driver, or an extremely loquacious raven, these Socratic dialogues slide pole to pole, from uncanny clarity or a realm where digression is an art of the first order, the multifarious zone of the nod. Jim Carroll died at his desk on September 11, 2009, in the Inwood neighborhood of Manhattan, where he was born and raised. His diamond mind never ceased writing, even as he read, scribbling copious notes in the margins of his books, the references of his life, Frank O’Hara, Saint Francis, Bruno Schulz. He was without guile, disdainful of his beauty, red-gold hair, lanky body, abstract, bareheaded, empty headed. Yet he was athletic with singular focus, netting his prey, able to pluck from the air with exquisite dexterity a rainbow-winged insect that quivered in his freckled hand, begetting memory. The catastrophe of loss, the loss of a true poet, is so pure that it might for many pass unnoticed. But the universe knows, and no doubt Jim Carroll was drawn from his labors and the prison of his own infirmities to the distances of the greater freedom. I remember lying in bed listening to some evening CFOX radio show. It was keyed to new music and was cohosted by Jerry Barad who, I believe, worked at Quintessence Records and maybe had some financial interest in it, as well. Barad went on to become COO of LiveNation. His role in 1980, was hepping listeners to new product at the record shop. He led into a cut by The Jim Carroll Band off its debut album, Catholic Boy. He told about how Carroll was a New York underground writer and poet. Then he played People Who Died. It was terrifying. It was the bleakest, darkest most macabre song I’d ever heard. It was a litany of people who had died and the various ways they shuffled off this mortal coil. I mean, Holy hell, what the heck was this? I was no wilting lily of the valley; Lou Reed’s depression fest, Berlin, was my favorite album, but this Jim Carroll guy was beyond the pale. He wasn’t just down, he was the voice of total devastation and evil. He was celebrating these deaths. I lay in bed, terrified. I don’t think I slept a wink that night. But, next morning, I know I was at the door of the record store the minute it opened to get my hands on a copy of that dark moist thing. 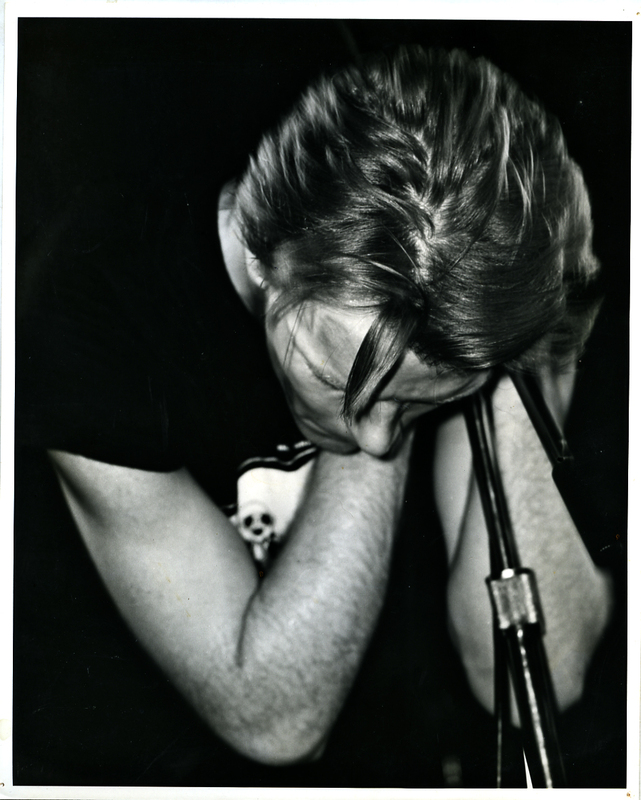 Postscript 1983: AW-H and I were in Manhattan and Lenny Kaye asked us if we wanted to go the Danceteria and see Jim Carroll read his poetry. Spectral Jim came over and joined our conversation that night. He was pale and as cold as the grave. I bet the guy pissed ice cubes. These days, email is fraught with dangers, though mostly human error and many a document can get greeked or corrupted and editors need to see what they can make of it. In order to do that, they need to know where it ends. Plus, I like the sound of tapping out -- 30---. It sounds a bit like the opening of Louie Louie. It also means another damned piece is finished. A sweet sound for sure.